Going to church each week is the best opportunity to be with other believers in Christ. It is one of the most important activities you can do to nurture your spiritual life. 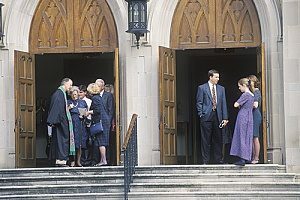 Faithful attendance in weekly church services is the best way to derive the many benefits church offers and put you on a path to God for the rest of your life. Going to church will help you become part of the community in Christ. Through our interactions with others, God will have you reflect more on life’s true purpose. Worshiping and living alongside other Christians through the fellowship of church will grow your love for God and for others. Think of church not as just a place to go to on Sunday mornings, but a place where believers gather to celebrate their spiritual journeys together. You are endowed with spiritual gifts of your own. To identify the gifts you have, consider reading biblical passages such as 1 Corinthians:12-14, Romans:12, Ephesians:1 & 4, and Peter:4. Once you understand how you are uniquely suited to help others, look for ways to use your gifts. You can speak to Pastor Paul at Fairfax Christ Lutheran or another congregant about how to study these passages. You never know until you reach out. God has a plan for all of us. It is often said that He knows the hairs on our heads and has ordered every one of our steps. Jeremiah 29:11 says, “For I know the plans I have for you,” “plans to give you hope and a future.” Regular church attendance can help you discover the purpose God intends for you. It may come to you suddenly as you listen to a sermon or as you pray, or it could be a still small voice that you hear during quiet contemplation. It could slowly dawn on you as you interact with the church family members. You will meet new friends when you attend church regularly and be encouraged to participate in the church community. The more you become involved, the more people will miss you when you do not attend. You will become part of the church family where people really do care about each other. The Scriptures call the community of believers “brothers and sisters” for a reason. When we feel gratitude for God’s love for us, we feel the desire to worship Him. As you come to know God, his love will conjure feelings of thankfulness in your heart. By expressing your gratitude in prayer, you can surely discover just how much you can feel His presence. This is the Spirit of God that causes believers to desire to come together with other believers to honor Christ. 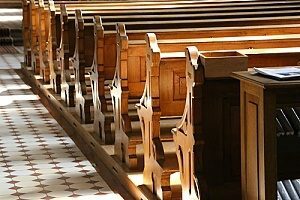 Hebrews 10:25 says we should “not [be] giving up meeting together, as some are in the habit of doing, but encouraging one another…” The author of Hebrews cautions against neglecting church services. You benefit from the encouragement that church attendance affords. When life seems too hard, or you suffer a setback, you will find the encouragement you need by attending church and living a God-centered life. People notice when you go to church. Your faithfulness sets an example that other your family members and friends notice. Your commitment to church attendance will lead you to living a better life, setting an example that others will want to emulate. Listening to a minister speak about the Scriptures is tremendous for your spiritual well-being. 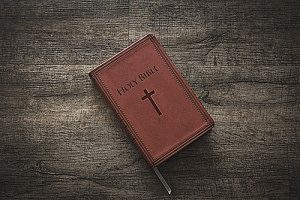 When you are hearing the word of God as you sit in close fellowship with other believers, you can understand and experience what Christ offers. According to the Scripture, Jesus could often be found at the synagogue. Luke 14:6 says that when Jesus went back to Nazareth, “‘as usual’ he went to the meeting place on the Sabbath.” The phrase “as usual” can be translated as “as was His custom”. As Christians, we have committed to follow the ways of Jesus, including following the examples he set. If you are motivated to become a dedicated follower in Christ, attending church regularly will strengthen your commitment. Attending church regularly will become a habit. It takes self-discipline not to give in to the temptation to sleep late on Sunday morning, or to have a leisurely breakfast instead of going to church. Once it becomes a habit, you are reaping all of the benefits church offers you, and you will look forward to the fellowship it provides every week. Find a Bible-based church near you and commit to regular attendance. If you are unsure which congregation works best for you, we encourage you to attend Sunday service at Christ Evangelical Lutheran Church. Our church family embraces all believers. To deepen your faith, live differently, and feel God’s presence and his blessings, begin by making a commitment to attend weekly Sunday church services. It may be one of the best decisions you ever make. Contact Christ Evangelical Lutheran Church today for more information.